We are now in the day and age of digital dictation and transcription. But, believe it or not, there are people and organisations out there who are still using some form of cassette tape to record dictation. 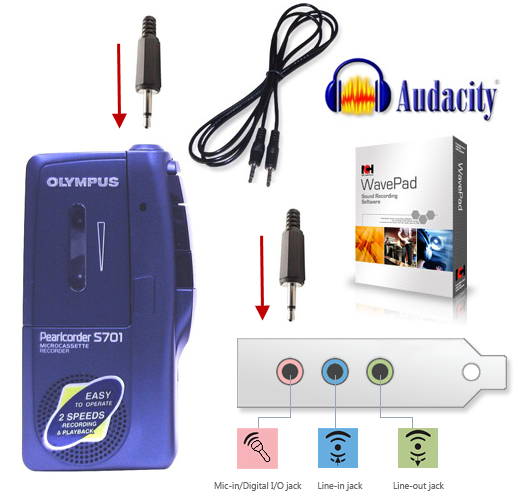 Olympus long ago discontinued their micro and mini cassette transcription kits (remember the old Pearlcorder brand?) and more recently their hand held tape dictaphones and the tapes bit the dust. So, what if you do transcription work and you only have digital transcription software, how do you get taped audio into a digital format for you to transcribe? Really it is quite simple as long as you have a device that can play the tape usually the device that made the recording if you have a microcassette or mini cassette. Standard tapes can be played back using a standard tape deck although you have to be careful as some standard cassette recordings can be made in double time which you won’t be able to play on a standard tape deck. As long as that tape player has an earphone or headphone jack you are in luck. As audio is played back through the earphone jack socket, typically to a headset or earpiece, when you play the tape use that output source and run it into the mic socket on your PC or Mac. To do this you will need a cable which on one end has a male jack plug the correct size to fit the earphone/headphone jack socket on the tape player. On the other end of the cable you will need another male jack plug the correct size to fit the mic socket on your PC or Mac. Don’t worry if the sockets on the tape player and your computer are different sizes, you can get adapters to change the male jack plug size. Once you have the cable all you need is some free audio recording software to record whatever your PC/Mac mic socket can hear as the tape is played back. Once recorded you can save the audio in your favourite digital format; mp3, wma, wav etc. One thing to watch out for is excessive noise output from the tape playing device. In our experience we have had to reduce the output volume on the player to very low. On the computer I recommend you adjust the mic in volume control to the lowest setting also. Keep an eye on the audio meter levels in the software you choose to record digitally, you will be able to see if the audio in is too much for your sound card. Remember this is taped audio, it will not be as crisp or clear as digital. Audacity: Open source, free audio recording software. Allows for audio editing and some effects like noise reduction. Wavepad: From everyones favourite audio software company NCH Swift Sound. Wavepad comes in a free limited functionality version and a paid full featured package. Your graphic above looks like your suggesting to insert it into the mic port of my computer. I’ve tried it but there’s a whole lot of static included. Enter: “Gateway color ports” in the subject line please. Yes correct with the Mic socket. As for the static all I can suggest is to turn the volume right down on the playback device to just above silent and see if that helps. Also just double check the audio out of the playback device, plug in some headphones and see how it sounds. How can you detect if an analog microcassette tape conversation has been altered? If there were anomalies does that mean something? This would be very difficult to detect as digital audio can easily be edited . Removing audio would be easier than inserting audio but it could be done. I do know that some police units use digital notetakers for this reasons, the audio is recorded on a notetaking device and left on that device where is can not be altered. Where do I get the cord you are referring to with both male ends for the headphone socket? Also, this is only good for minute per minute recording, correct? I have a transcription business and when I get a lot of tapes in, I need to convert to digital voice files so that I can upload onto the computer. However, I would prefer something that will copy from the microcassette or mini cassette and very hight speed versus having to play the tape and rerecord. That would take all day if I have 5-10 tapes. Any ideas on that? The cable you should be able to pick up at any hi-fi or electrical store, here in Australia we can also get them from OfficeWorks which is a large office supply chain. We too run a transcription business, one of the largest in Australia called The Transcription People. You are correct, it is a slow minute by minute process which is exactly why you should convert your clients to the benefits of digital dictation instead of using tapes. The whole reason this blog and our Dictate Australia store exists was because in the early days most of our transcription clients also used tapes, we started the digital voice business to help them move away from tapes and to go digital. When we have multiple tapes, which luckily is rare these day, the best you can do is run multiple players feeding multiple computers, which will process the tapes quicker.